A Short time ago I did a video on " How to expand you wireless range using an old router" and I have had a very positive response. Along with that has come a flurry of questions and comments directed at various setup options and how to configure various wireless situations. The one comment I have received most often was how can I extend my wireless range without running an Ethernet cable to the new access point. In other words, how can I easily extend my wireless network wirelessly. I came across this device called the Two in One router from a company called HomeScreen that will work perfectly for this purpose. This is a new product that looked very promising and so I contacted the company to offer to share the product with you. The HomeScreen Two in One router is both a regular everyday dual band wireless router and also a wireless range expander or wireless repeater. But this is no everyday router, this is a completely new design with a touchscreen and the footprint of a deck of cards. Having been in the networking industry for many years I have never seen a device so easy to use and setup and still contain all of the advances features that Geeks like me can't live without. 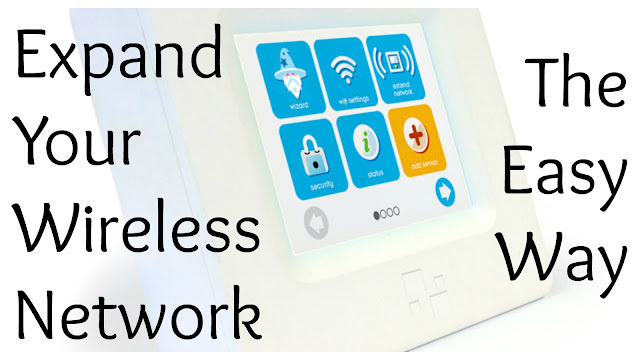 The device has all of the features of a standard router including wireless isolation, guest networks, dual band AC wireless, user restrictions, content restrictions, DMZ configuration, time restrictions, and full advanced configuration. But it also has some goodies that only a router with a touchscreen can offer. The device contains a small screen that display the weather, acts as a digital photo frame, can be used as a clock, and also control other smart home devices that can be added to your HomeScreen account. The device has easy to follow wizards for setup and comes with a stylus for ease of use. The device can also be configured and maintained using the HomeScreen app available for Android and IOS. The setup of the router is as easy as answering a few questions. In my case I wanted to set it up as a wireless range extender in my home. Step one, power it on. Step two, select Range Extender. Step three, select your network from the list. Step four, enter your network password. Step five - Done. That is all it takes to expand your wireless network in your home. This can be plugged in anywhere in between the area of low signal in your home and your main router and it will pickup the main signal and rebroadcast it. I tested the device in various areas of my home and it outperformed my Linksys and Netgear routers for signal strength and allowed my to get full signal to the far end of our home above the garage. HomeScreen was nice enough to let me test this product out and share my experience with you and I thought to be fair it would be nice to share that generosity with you. Starting June 24th, 2015 at 6:00 am EST and ending on July 15th at 6:00am EST Simple Suburban Living will be giving this HomeScreen Two in One router away to one randomly selecting winner through a sweepstakes. All you need to do to enter is subscribe to the SSLFamily Blog to receive updates from us. You can unsubscribe at any time after the contest ends if you do not wish to receive updates from our site. Your email address will not be shared or sold to anyone and will only be used to notify you when a new blog article is released. If you are already subscribed to the blog please email us directly that you would like to be entered at sslfamily5@gmail.com. Only one entry per person will entered. United States and Canada only please. The “HomeScreen Two-In-One Router Contest” is sponsored by Simple Suburban Living (“Sponsor”)This contest is governed by these official rules (“Official Rules”). By participating in the contest, each entrant agrees to abide by these Official Rules, including all eligibility requirements, and understands that the results of the contest, as determined by Sponsor and its agents, are final in all respects. The contest is subject to all federal, state and local laws and regulations and is void where prohibited by law. This promotion is in no way sponsored, endorsed or administered by, or associated with, YouTube. Any questions, comments or complaints regarding the promotion will be directed to Sponsor, not YouTube. The Contest is open to legal residents of the United States and Canada where not prohibited by law, who are eighteen (18) years of age or older at the time of entry who have Internet access and a valid e-mail account prior to the beginning of the Contest Period. Sponsor has the right to verify the eligibility of each entrant. SWEEPSTAKES PERIOD The Sweepstakes begins on June 24th, 2015 at 6:00am EST and ends on July 15th, 2015, 6:00am EST. (“Sweepstakes Period”). All entries (submissions) must be received on or before the time stated during that submission period. Sponsor reserves the right to extend or shorten the contest at their sole discretion. All eligible entries received during the Submission Period will gathered into a database at the end of the Submission Period. A winner will be chosen at random. The winners will be announced on or about July 20th, 2015 on or about noon EST. Announcement and instructions for prize will be sent to the e-mail address supplied on the potential prize winner’s submission. Each entrant is responsible for monitoring his/her e-mail account for prize notification and receipt or other communications related to this sweepstakes. If a potential prize winner cannot be reached by Administrator (or Sponsor) within fifteen (15) days, using the contact information provided at the time of entry, or if the prize is returned as undeliverable, that potential prize winner shall forfeit the prize. Upon the request of the Sponsor, the potential winner may be required to return an Affidavit of Eligibility, Release and Prize Acceptance Form and IRS W-9 form. If a potential winner fails to comply with these official rules, that potential winner will be disqualified. Prizes may not be awarded if an insufficient number of eligible entries are received. Grand Prize: (1) Two-In-One HomeScreen Router as displayed in the associated video. ALL FEDERAL, STATE AND LOCAL TAXES ASSOCIATED WITH THE RECEIPT OR USE OF ANY PRIZE IS SOLELY THE RESPONSIBILITY OF THE WINNER. INDEMNIFICATION AND LIMITATION OF LIABILITY BY ENTERING THE SWEEPSTAKES, EACH ENTRANT AGREES TO INDEMNIFY, RELEASE AND HOLD HARMLESS SPONSOR AND ITS PARENT, AFFILIATE AND SUBSIDIARY COMPANIES, ADMINISTRATOR, ADVERTISING AND PROMOTIONAL AGENCIES, AND ALL THEIR RESPECTIVE OFFICERS, DIRECTORS, EMPLOYEES, REPRESENTATIVES AND AGENTS FROM ANY LIABILITY, DAMAGES, LOSSES OR INJURY RESULTING IN WHOLE OR IN PART, DIRECTLY OR INDIRECTLY, FROM THAT ENTRANT’S PARTICIPATION IN THE SWEEPSTAKES AND THE ACCEPTANCE, USE OR MISUSE OF ANY PRIZE THAT MAY BE WON. SPONSOR AND ITS PARENT, AFFILIATE AND SUBSIDIARY COMPANIES DO NOT MAKE ANY WARRANTIES, EXPRESS OR IMPLIED, AS TO THE CONDITION, FITNESS OR MERCHANTABILITY OF THE PRIZE. SPONSOR AND ITS PARENTS, SUBSIDIARIES, AFFILIATES, ADVERTISING AND PROMOTIONAL AGENCIES, AND ALL THEIR RESPECTIVE OFFICERS, DIRECTORS, EMPLOYEES, REPRESENTATIVES AND AGENTS DISCLAIM ANY LIABILITY FOR DAMAGE TO ANY COMPUTER SYSTEM RESULTING FROM ACCESS TO OR THE DOWNLOAD OF INFORMATION OR MATERIALS CONNECTED WITH THE SWEEPSTAKES. Has anyone won this as of yet ? I subscribed and found you on YouTube today and could truly use that WAP here where we live in the country for our A-Frame Home. Let me know and thanks it would be an honor to win this item. By the way keep up the great work and you have a beautiful Family. God Bless. Thanks so much for subscribing and following along! If we receive another coupon code from the company, we will pass along as soon as possible! Will this extender work if my house and garage shop have two different electric services? Thanks. Yes, that should not be an issue since you are running an Ethernet cable to communicate with the access point, it is not using the electrical wiring for communication.